Dropbox is undoubtedly one of the biggest and finest online service offering virtual storage space, starting from free web space it allows to bring your documents, photos and videos anywhere and share with your anyone. Dropbox was founded by two students of MIT, Drew Houston and Arash Ferdowsi back in 2007, who got weary of emailing files to themselves. It provides cloud storage, file sync and client software. There are number of explicit features that assist Dropbox to retain its position as one of the world’s most adorable online storage companies. It serves over 100 million clients every day in safely storing their valuable stuff and to share it with family and friends. Simplicity is a feature they greatly emphasized upon, no complex settings for installing the software and easy drag and drop uploading. 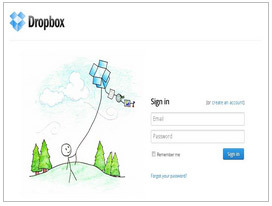 Dropbox has an independent platform as you can use dropbox on Windows, Mac, Linux and Smartphone. Automated synchronization with offline access of files, your revised files which are saved on your computer or smart phone will be synchronized to your dropbox account as you get connected with internet and accessible through any device. It also has this incredible feature to upload just the changes instead of saving whole file again, that definitely helps in saving bandwidth. Dropbox is a free Cloud Storage and Data Backup service that lets you bring your photos, docs, and videos anywhere and share them easily. Never email yourself a file again!